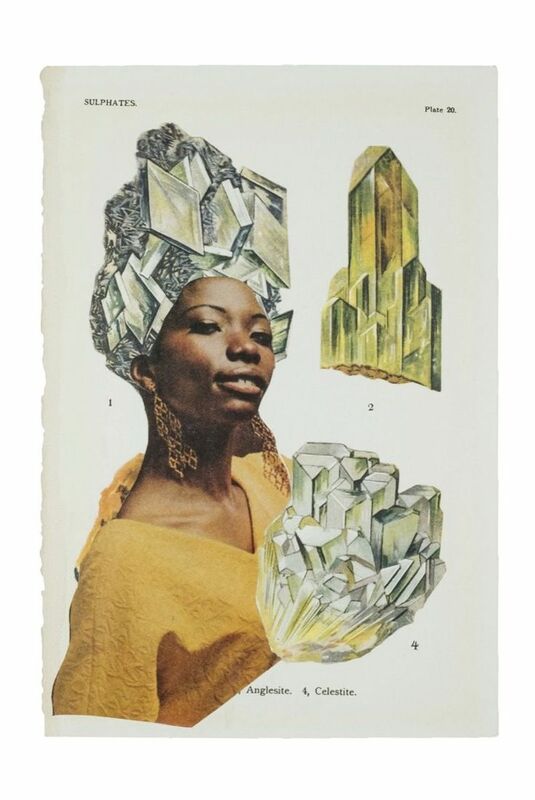 Lorna Simpson Maps the Complex Galaxies of Black Women’s Hair | The Atlantic The artist’s new book of collages incorporates magazine clippings, watercolor, and geological formations. Black women’s heads of hair are galaxies unto themselves,” poet and professor Elizabeth Alexander writes in her introduction to Lorna Simpson Collages, a new book of that artist’s work. Much of Simpson’s career has been dedicated to documenting the specificity and breadth of black womanhood, and this collection continues in that vein. Black women’s hair, that fraught matter, is not simply the inspiration for this set of collages; it is the subject. Left: Lorna Simpson. Tulip, 2014. Galerie Nathalie Obadia. Right: Lorna Simpson, Speechless, 2017. Published by Chronicle Books, 2018. Photo Credit Lorna Simpson: Collages. Left: Lorna Simpson, Earth & Sky, #17, 2016. Right: Lorna Simpson, Earth & Sky, #30, 2016. Published by Chronicle Books, 2018. Photo Credit Lorna Simpson: Collages.